The Glassbottom Boat Tours depart from Rum Point located in the Cayman Kai area (about an hour drive from Georgetown and a 25 minute drive from Morritts Tortuga Resort and The Reef Resort). 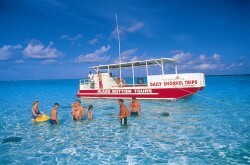 We offer snorkel trips to Stingray City Sandbar, which is a convenient 15 minute boat ride from the pier. Play with the Southern Stingrays or stay dry if you choose to pass on the snorkeling. This trip includes a second snorkel stop at a shallow reef. Families love this Cayman Stingray City adventure! All persons must complete waiver forms prior to boarding boats. An adult must accompany all children under 18 years. There will not be any charge for infants or children 2 years and younger, but older children will be required to pay full price. A major credit card is needed to guarantee your reservation for all activities. All prices are in U.S. Dollars and subject to change without notice. Advance reservations will be charged in full 24 hours prior to the activity date. Check-in with Red Sail Sports is required 24 hours prior to your scheduled activity. Any cancellations or rescheduling requests made prior to 24 hours of the scheduled activity time will not be charged any penalty fees. Any cancellations or rescheduling requests made within 24 hours of scheduled activity time will be charged full price of scheduled activity. Guests who NO SHOW will be charged full price. Departure points are subject to change, dependent on weather. Bookings cancelled due to weather, acts of God or circumstances beyond the control of Tortuga Divers with Red Sail Sports will be rescheduled or are subject to a full refund. For more information about Tortuga Divers activities visit www.tortugadivers.com or email tortugad@tortugadivers.com. For more information about Red Sail Sports activities visit www.redsailcayman.com or email info@redsailcayman.com.